My favourite day ‘get away’ from Darwin in the wet season. Located just east of Darwin is Gunn Point. The western side of Gunn Point Peninsula is denoted as Murrumujuk and derives its name from a sacred aboriginal site on the beach. Murrumujuk is the long sandy beach between Gunn Point and Tree Point, although I have never heard anyone referring to it as Murrumujuk Beach. It is normally referred to as Gunn Point beach. This beach represents one of the three beaches that can be frequented in the area around Darwin. 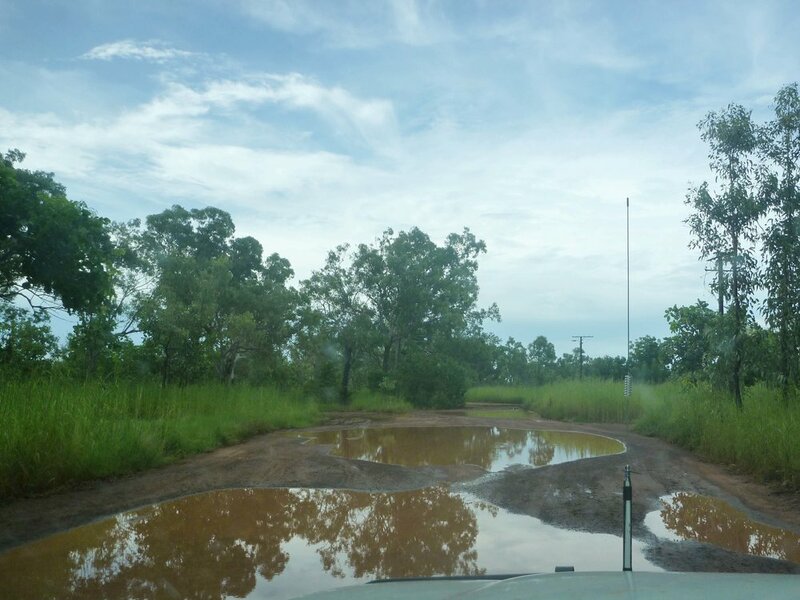 This is a popular bush-camping site during the dry season, with no fresh water or toilet facilities. The beach sees a fair amount of traffic during the Dry and you can expect quad bikes, motorbikes and even the odd idiot hooning up and down the beach. Litter can be a problem, and the lack of toilet facilities means that venturing into the bush lining the beach can be daunting. Notwithstanding the above, it is still a great spot to camp out at for a weekend away from Darwin. My favourite time of the year to visit this beach remains the wet season. The humidity, mosquitoes, and midges make it unsuitable for camping, so it remains deserted for most of the Wet. It is an easy day trip from Darwin and we will often spend the day exploring the beach and adjacent bushland. Sunsets can be spectacular, especially if there is some cloud cover around, and opportunities arise for stunning photos. The beach and the small creek towards the northern end of the beach are popular places for fishing. We have never caught anything substantial but have spent many hours catching small whiting about the size of large pilchards. With the arrival of the wet season storms, huge numbers of shells are washed onto the beach. Of particular interest are the heart urchin shells and the sand dollars that are washed up in huge numbers. This beach is also renowned for the occasional fossil that can be found. The unstable cliffs behind the beach are slowly eroding and depositing their fossilised content on the beach. Look out for fossil ammonites and mangrove lobsters between the shells. This section of sandy beach is about 13km long and stretches between Gunn Point in the north and Tree Point Conservation in the south. Driving and camping is only allowed on the northern section of the beach, about 5km of accessible beach. The southern section heading towards Tree Point Conservation area and the Durduga Community is off limits to beach driving and camping. A signpost above the highwater mark indicates the point beyond which no cars and camping are permitted, although walking along the beach to The Rock at the southern tip of Tree Point is allowed. The section above the high-water mark in this area is Aboriginal freehold tenure, and notice to keep out of this area is well signposted. Warning: Saltwater crocodiles inhabit this area. From Darwin City it’s about an hour’s drive To Gunn Point Beach (Murrumujuk). From the Stuart highway take the Howard Springs Road (about 50km to the beach from this point) it will become Gunn Point Rd and just after crossing the little Howard River it becomes a graded dirt road. This section of road can vary considerably depending on when it was last graded. Most of the time it is extremely corrugated. During the Wet, sections can become muddy with potholes and it has been closed on occasion. Remain on Gunn Point road, pass the Leaders Creek turn off on your right and continue till the graded road comes to an end. The road then breaks up into tracks that lead to the beach. Heading in a northerly direction along this track (for just over 1.5km) provides the easiest access to the beach. The northern access road has developed some rather deep pools over the years and I have seen people getting bogged in these. In most cases however, if you are able to stick to the sides of these water holes you should get through. On arriving at this section of the beach you should be at, or very close to, a small tidal creek. This tidal creek is impassable at high tide and cuts off about 1.5km of beach access. Underestimate this creek at your peril. A testament to its danger may be found in the local NT news as follows. Tidal movement in this area can be 7m or more, exposing large flat areas of ‘beach’. Do NOT be tempted to drive on these flats as they often have just a thin layer of sand over soft blue clay. Once bogged it becomes a race against that 7m tide to extract your vehicle. Access points to and from the beach abound along this section of beach. For the 4x4 enthusiast, these may provide more of a challenge getting onto the beach. However, when considering these tracks think of the long-term effects and how much damage you may be causing. Avoid excessive tearing up of the tracks that promotes erosion during the wet season. Great fun can be had exploring these tracks and they change after each wet season. The southern entrance/exit can be filled with water in the Wet and can be boggy, so avoid it if you are trying to avoid any adventure. It is marked as a short red line on the map. Get out and explore this beach on Darwin’s doorstep. The southern entrance/exit can be filled with water in the Wet and can be boggy.